New accounts will require a minimum $250 purchase to qualify for wholesale prices. Each sequential order requires a minimum of $150. Due to the nature of handmade items, all orders must be paid in full before production can begin. Make sure to follow the minimum quantities when placing your order. While we strive for consistency, each handmade piece will have its own unique appearance and personality. We will strive to do our best to create multiple quantities with minimal differences. All wholesales are final sale unless damaged via shipping, in which case we will do our best to replace the item as close to the original as possible. Please allow 4 - 6 weeks (usually faster than slower depending on items ordered) for delivery from the date that your order was placed. Times are subject to change per order. You must agree to this timeline before an order can be placed. Please remember that our items are handmade and take time to produce in our shop. All orders include a USPS tracking number and are shipped from Oklahoma City, Oklahoma. International orders require a shipping account number from the stockist in order to keep shipping costs low. 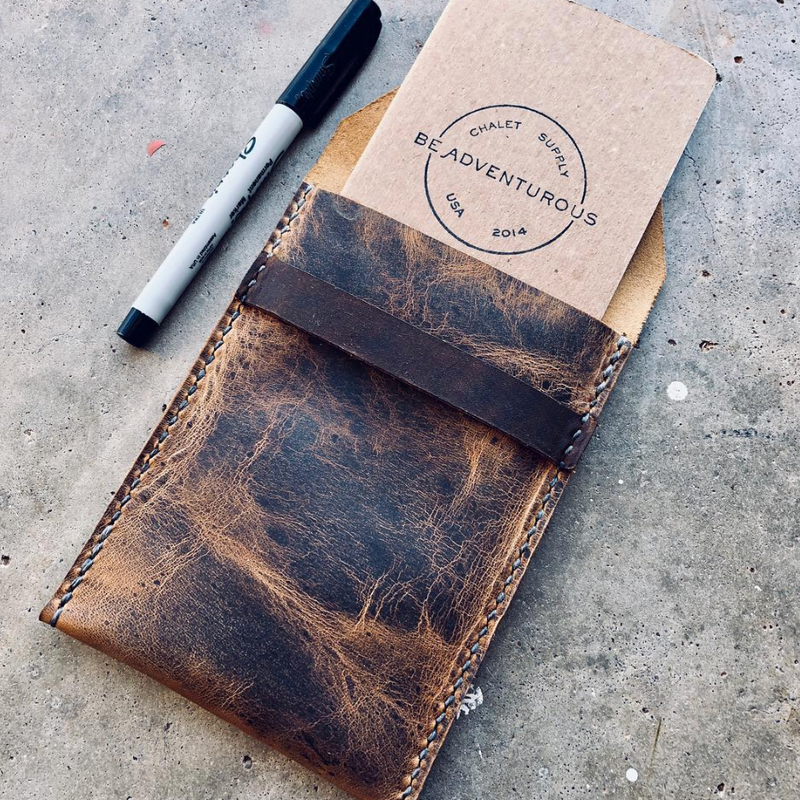 Our Rustic Hiker Leather is shown in all product photos however, our leather supply is always changing allowing us to have different options of color and types at different times. We will work with you to figure out the best leather suited to your needs. Fits any 3.5 x 5.5 Notebook. Comes with 1 Notebook. Great for iPads, Magazines, Notepads, Pens, & More.